Summer is upon us and that means boating, fishing and swimming! Find your place on the water this year but know what you are buying… Lake types are determined by how water enters the lake. The water sources include groundwater, surface water, the watershed and direct precipitation. Below is information on the five different lake types in Wisconsin. A seepage lake does not have an inlet or outlet. They are landlocked bodies of water whose main source is precipitation, runoff and groundwater. Water levels fluctuate with rainfall patterns, when there is a drought the water level drops. Seepage lakes are the most common lake type in Wisconsin. A spring lake has an outlet, but no inlet. Groundwater flowing into the bottom of the lake from the immediate drainage area is the main source of water for these lakes. Spring lakes are often the headwaters of many streams. Lac Vieux Desert, a 4600 acre lake in Vilas County is the headwaters of the Wisconsin River. Like spring lakes, these lakes have an outlet, but no inlet. Their main source of water is from precipitation and drainage.. Drained lakes are the least common type lake in Wisconsin. Drainage lakes have both an inlet and outlet. Most major rivers in Wisconsin have drainage lakes along their course. An example is the Eagle River Chain of Lakes and Lake Mohawksin in Tomahawk which are part of the Wisconsin River. An impoundment is an artificial lake created by a dam or other structure. These are also considered drainage lakes since they have an inlet and an outlet with its main source of water coming from a stream or river. Lake Nokomis in Lincoln County is an impoundment of the Tomahawk River. 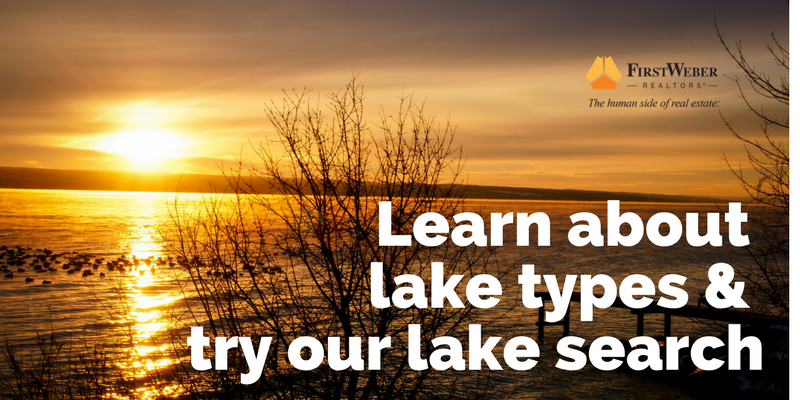 When considering lake property in Wisconsin, be sure to ask your agent what the lake type is. Article provided by Sandy Ebben, Vice President and Manager of First Weber’s Rhinelander office, is a Lake Mildred resident in Northwoods Wisconsin.